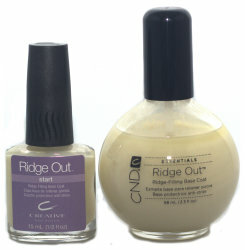 A ridge filling base coat designed to mask imperfections and anchor enamel to the nail. Fills ridges in the nail to create a smooth surface for enamel application. 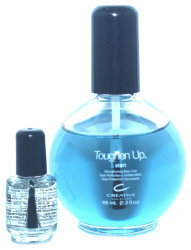 Strengthens and toughens thin, weak natural nails. Improves nail enamel wearability. A protective, non-yellowing fast dry top coat that quickly seals and protects enamel while UV absorbers prevent yellowing and guard against fading and discoloration. For an instant, durable long-lasting shine. Fast set top coat. Quickly seals the surface of nail enamel. UV absorbers guard against fading and discoloration. For instant shine. For quick manicure service. Super Matte Top Coat is a protective matte finish top coat that transforms glossy nail color to a modern matte finish. For a high-gloss, fast acting, extra hard top coat, Super Shiney is the ultimate. 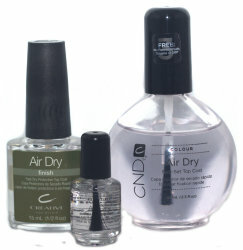 One coat over Creative Nail Design enamel will increase wearability and help prevent chipping and peeling. Or, apply one coat over natural nails for a mirror-like shine.